Over the past 17 years of commercial real estate brokerage, I have completed more than 375 transactions totaling over 16 million SF specializing in all aspects of Industrial Tenant and Landlord representation. I have extensive experience in assessing and negotiating lease transactions. My core strength is to fully evaluate projects’ comprehensive requirements and to develop and implement final solutions that meet and exceed goals. I began my real estate career in brokerage, specializing in industrial advisory services and worked as part of the Corporate Services Group. Since then, I have worked for institutional owners such as First Industrial and ProLogis. Prior to my return to brokerage, I spent four years with ProLogis, the largest owner of industrial properties in the world. Serving as Market Representative for Indianapolis, I co-managed a 55-building portfolio of over 200 tenants totaling 10.5 million SF. I am actively engaged in multiple community efforts, including Leadership Hendricks County, Shepherd Community Center and Dress for Success-Indianapolis. I provide corporate real estate advisory services for industrial and corporate account clients. Partnered with Andrea Hopper, our team specializes in Modern Bulk Industrial product, representing tenants, landlords and investors across the country. Since joining the firm in 2014, I have represented clients in transactions exceeding $285,000,000. Prior to joining the firm, I worked in public accounting with one of the big four accounting firms, Deloitte. Serving in the audit practice, I acquired and perfected project management and financial analysis skills while managing quarterly and annual audits of both publicly traded and privately held companies. These valuable experiences have enabled me to better understand how all decisions can affect a company’s bottom line. In 2018, Andrea and Jimmy earned the Peak Performance Brokerage award for Indianapolis office in recognition of their strong production as well as their established best practices and contributions to the office’s industrial team initiatives. 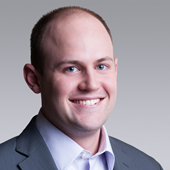 In 2015, Jimmy was a nominee for the U.S. Colliers Rising Star Award. A graduate of Purdue University’s Krannert School of Management, I have a degree in accounting and have also obtained my Certificate of Advanced Accountancy. I am an active volunteer at Cathedral High School and serve on the Cathedral Alumni Board of Directors while also assisting with multiple fundraising efforts throughout the year. I am an avid golfer and have participated in several Indiana Golf Association tournaments.